The Northamptonshire guys very kindly slotted a trial game into the Friday schedule ... the 'Double Width' Intro scheme I'd discussed on my ECW blog (full story on this link ...). 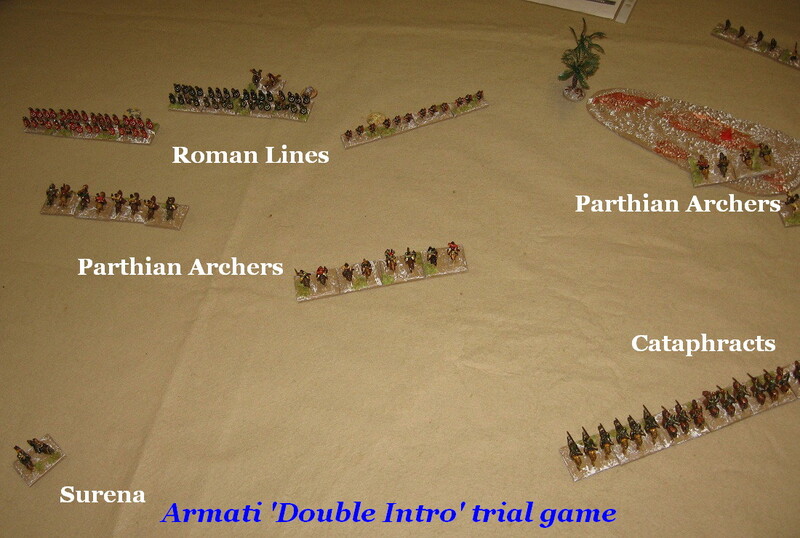 For ECW historical games I have been using the Intro Ruler rather than the Optimal Ruler (Armati uses a MU system for accommodating different scale figures: true inches for 25mm; two thirds inches for 15mm; and one third inches for Intro scale in which a single base is a unit). Although Optimal scale is the most commonly played game, Intro has many merits: all the units are the same width (solving some of the clunkiness of the Optimal game where unit widths can be varied with mixed results), and at one third standard, the movement is more in line with the movement common amongst other game rules. Having successfully used a 2" MU with 15mm figures for my FoG-base Jerusalem game, I had no worries about using 'the wrong' measuring convention for Armati. Nevertheless, players consenting to a full blown trial is great. We played 75 bonus points worth of Graham Evans Parthians against Romans - and nice it was to see them out on the table after a while in barracks. Some of those splendid Peter Pig figures that are not so frequently seen. 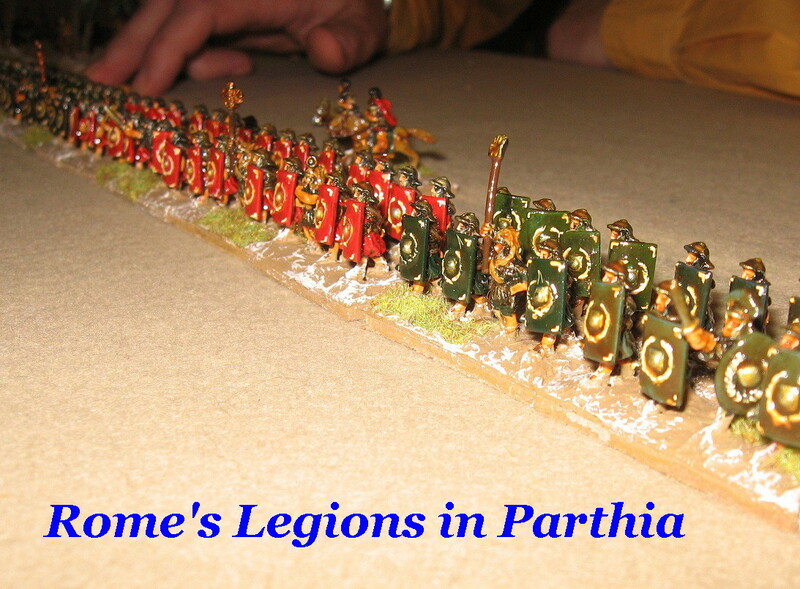 I thought these might be good armies to use as in conventional Armati, Parthians can be a bit of a problem (two evades and you are off table ...).. Of course it might unbalance the other way - with less limited space, it might be that the horsemen cannot be caught, so the game is an unwinnable chase down artificially rigged against the infantry. In fact the game we had was very close. 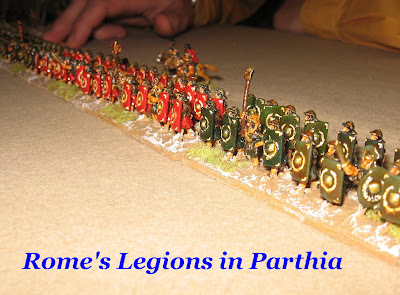 The Romans were BP4, the Parthians BP6 ... and at the start of what turned out to be the final turn the Romans were 2 down, the Parthians 5. However, the Romans' best chance for the critical break was against a shredded Cataphract unit trapped in melee with equally worn Legionaries, and this disappeared with a flank charge and a die roll (leaving the Romans with no obvious sixth kill, and a couple more cohorts already 3 down and surrounded by horse archers) ..
Crucially, all the players liked the game and thought it both different to the standard ruler game and more like a conventional battle. I was surprised at the extent to which it was different ... and it was interesting that both Will and I (the more experienced Armati players in the game) got out manoeuvred by our less canny opponents. Changing the ruler so that deployment becomes around four moves to contact rather than two allows scope for tactical development (on the Roman right flank a cavalry division went round the outside of the oasis, but was not 'taken out of the game' as a consequence) .... deployment was not the key to the game (to the extent that it can be with the Optimal Ruler, especially when allied to deployment screens - so where to set up is simply educated guesswork) ... I wouldn't declare this a 'case proven' on the basis of the trial (given that both Parthian players admit to mistakes but the army still won) ... nevertheless, all players enjoyed the game and thought it ran properly. 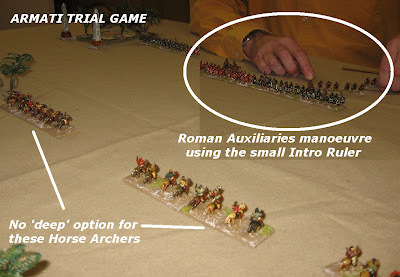 No horse archer units were lost or hamstrung by being pinned against the table edge, and the armies were able to adjust to each other after deployment in what turned out to be a close game. A lot of boxes ticked. I will append an exact specification of the rules used at the end of the post*. It was an interestingly quick transition to be setting up my third contest in this year's Championship. A return match against Will, this time I tried an (A2) Italian Ostrogothic against his Late Roman (Western) ... and this time Will had reconfigured the Romans to the (I think) more vicious looking 'first A2 Late Roman' list (Armati players will know the one I mean, with non-key LHI etc.). We used all the standard 15mm tournament rules, Optimal scale Rulers, deployment screen etc. 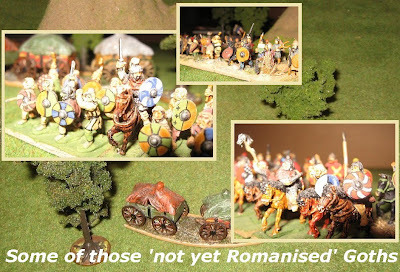 A word about the armies: this was a first go for me for Ostrogoths (the list looks 'interesting' and a suitable opponent for Late Romans). It has piles of obligatory charging FV5 HC, and should you take all the light units, the net spec. of 4 heavy controlled divisions, three light and Init:5 is quite a viable top line. Taking all the lights also gives you a potentially useful 8 Skirmish Infantry with bow. The conundrum is the Gothic Foot. I like the look of FV5 Spear/Bow FT, but they are a mixed blessing ... to shoot properly they need to deploy wide, but wide, they are potential victims of being outshot by non-key skirmishers shooting on a 1 wide front (and I knew Will would field plenty of these)... 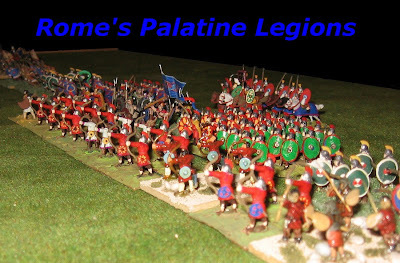 I also (rightly) expected that Will would come at me with Palatine Legionaries deployed in depth (again battering the wider line). A worthy experiment, then, and I opted to dismount some HC in the middle of the line to boost the melee factors of the infantry (looking for FV5 + wider + stiffened to give me a 7 vs the Roman 6 at contact if I could). 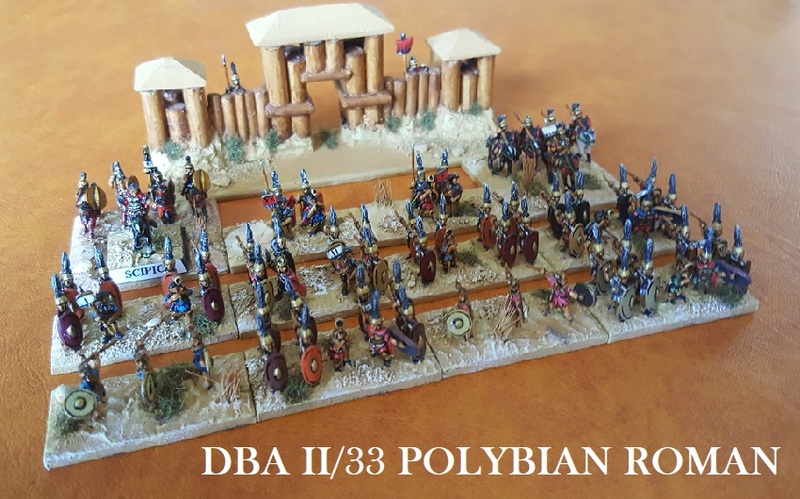 Will's reconfigured Romans had the same infantry core and batteries of SI bowmen as previously, 5 units of LC (two with bow), plus 6 non-key auxilia (2 LI, 4 LHI). All this left only 1 HC. In a sense, a Gothic nightmare, as this clearly leaves them outnumbered in LC while key HC have to batter through the auxiliaries to get to anything 'battle winning' to melee. That said, and despite all the light and light-heavy opposition, the Goths enjoyed a 5:1 advantage in mounted warriors. On the centre right we came to grips quickly: Will hung back too long with his LC (not wanting to take on SI bowmen who had HC they could evade beyond), but pressed ahead with the foot. This left a gap, and so I threw the whole line forward (well, I say 'I' ... obligatory charges did some of it, choice made it everyone) ... my 2 LC charged a block of his 3. My main HC division ploughed into his LHI, and a single unit division got through the gap and engaged his lone HC reserve with general attached. That I liked ... the rest was the best way to achieve it. The LC melee went against me, the LHI took a couple of turns to chew through, and I lost the (level) dice off against the HC! Disaster! Well ... not as good as I hoped - but good enough, as, although I was losing the cavalry fight, the victors from charging the auxiliaries arrived in time to sweep in with impetus and destroy the unit and commander at the critical moment. That was an important part of my game plan, as with such a low Army BP, taking out the HC with commander is the job half done. On the other flank I inevitably lost everything to javelins and horse bows ... an 'out of command' Frankish Warband, 2 units of HC, all my skirmishers, and the end of my Gothic infantry line. Most of my 6 Break Points. However, in the end, the LC fight was a trade of a key unit each, and in the centre (which was the left flank of Will's more compact line), I edged a protracted melee against the Legionaries (indeed, the margin was shaded by the wider unit modifier to which I added the Gothic general in addition) ... I was 5 down and the Romans were broken. 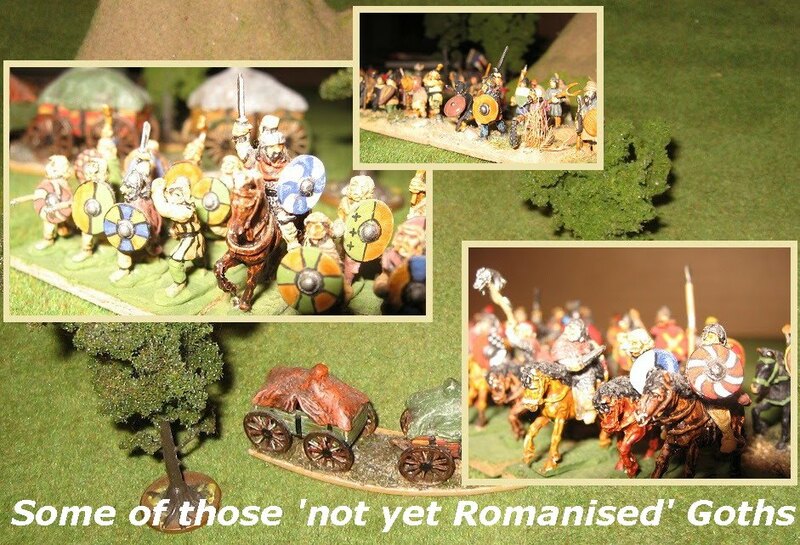 Verdict on the Romans: take another unit of HC and be more aggressive with your Light Cavalry! Verdict on the two games? Obviously the Roman/Parthian game had merit all of its own as it was a 4 player game. Of course, as both players enjoy the contest, the Roman/Goth game was also a thriller (indeed both went to the last unit). I think both players felt the Intro Ruler game played better and more plausibly than the conventional 'smash and grab raid' Optimal Ruler, and probably gave a more convincing depiction of ancient battle. There is a lot more mileage in this. For the Society of Ancients Championship go to the webpage (The Championship) ... Join in - any member can enter and any rules can be used.